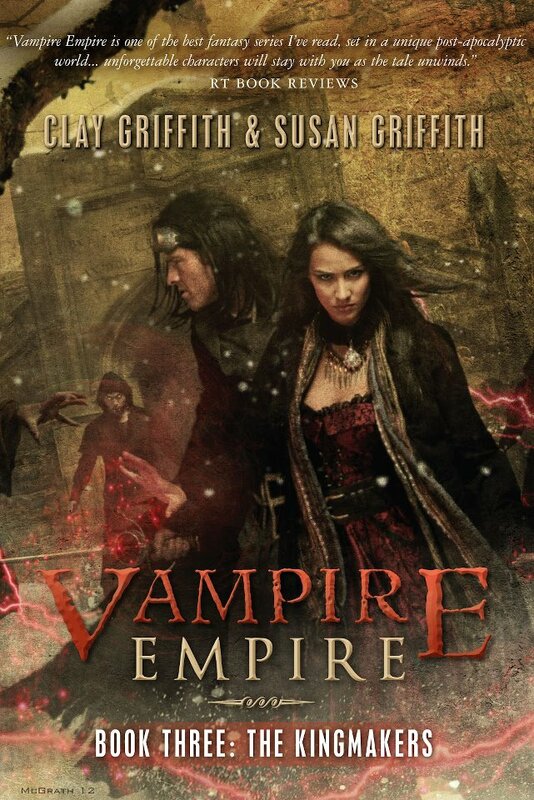 Epic doesn’t even begin to describe Kingmakers, the final novel of the Vampire Empire trilogy. Each installment is better than the last; Susan and Clay Griffith have done an amazing job at building momentum to this moment and it really doesn’t disappoint. Adele leads the war against vampires to the north and Gareth is getting first hand experience with the it, fighting for Adele in the front lines of battle. But the vampires are formidable opponents and have gained the upper hand, quickly bringing the humans to their knees. Something must be done and Adele’s geomancy powers may be the ace in the hole that the human race needs to win once and for all. The last novel is jam packed with story, but there’s a lot of action so it gets going much faster than its predecessors. Politics, betrayal, and new revelations are key to Adele and Gareth’s development. They are the heart of this saga after all. But with their seemingly impossible love, can the heart still beat? Adele has matured wonderfully over the novels and she’s become really admirable. I liked seeing her in a major position of power, strategizing and making difficult decisions that challenge morality. 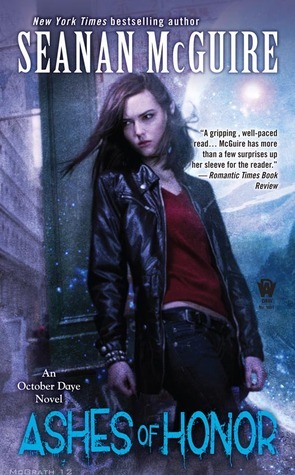 It’s a nice departure from other urban fantasy novels where the heroines start at the bottom and have to work their way up. She’s on a slippery slope as she tries to control her geomancy powers, which may be dangerous to more than solely vampires. Gareth is as wonderful as always with his selflessness. He’s even adorable at times as he still tries to fully understand human customs and history. His light moments with Adele really gave me the case of the warm fuzzies, if only because it feels so fleeting as the pull of his vampire heritage requires that he finally face his brother once and for all. That, and her powers seriously conflict with his entire being on a biological level beyond their control. Well done to the Griffiths on their fantastic work! This is definitely one of my favorite trilogies ever. Did I spaz like a teenybopper at a Justin Bieber concert when I saw this? Maybe just a smidgen. 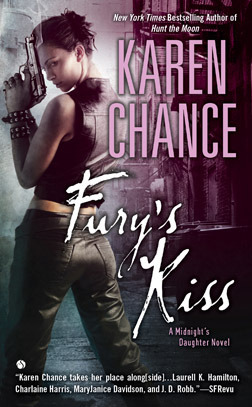 I SO can’t wait to get my paws on this! If there’s anything I regret most with this series, it’s that I didn’t wait for all books to be released when I started it. Anyway, the cover looks fantastic! Adele looks badass, too! This is probably my favorite cover with her. I liked his pose more on the second one. But I like the background the best here with the vampires. Looks scary! The Rift Walker (Book 2 in the Vampire Empire series) takes place a number of months after first book, The Greyfriar. 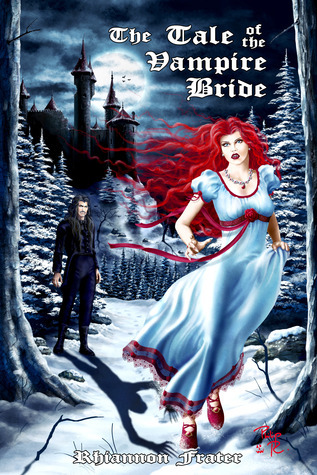 Adele is trying her best to stall her wedding, and in turn stall the impending war against the vampires, which would come at a much higher price than Adele is willing to pay. Lucky for her she has Greyfriar who returns to her side, putting us on pace for another swashbuckling adventure, and then some. They are on the run with her nation, her husband-to-be are on their trail, leaving her home vulnerable to enemy vampires’ advances. Over the course of this novel Adele’s powers of geomancy are increasing to an end that no one can predict. Her love, The Greyfriar, is determined to stay by her side anyway, even if it’s to his own detriment, and the loyalties of a choice few in her court are tested as they also stand with the princess through much adversity. First off, the model for the covers of these books totally reminds me of Mitchell the vampire on BBC’s Being Human, played by actor Aidan Turner. I figured this was a good pic to use since the costuming is fairly close, though that’s from a photoshoot for The Hobbit. As for the story, there was a lot of ground covered in this book with many significant developments. I was told that I should wait for the 3rd and final book to be released before reading this series; I though I’d be fine. But I’ve become quite attached to the characters and this world now. I am anxious to see how this saga ends so I sort of wish I heeded that advice. Adele and Greyfriar’s love seems more and more impossible by the page but they are still fighting hard for each other and that’s really admirable to me. I just have a bad feeling about it, even though I want to be as hopeful as the two characters seem to be. I still love Adele and Greyfriar the most, but her cat, Pet, is certainly up there. Their moments are super adorable with the little fur ball and (along with Adele and The Greyfriar’s moments) I admit it gave me the warm fuzzies. Unlike the first book where it took the 50% mark to get me hooked, this book got going around the 33% mark, though the beginning is still fairly slow. At this point slow starts can be considered a pattern for this series. Like the first book there is a blend of action, world building, and character development that really rounds out the story. It’s all well done, despite the boring politics. I really look forward to September, or maybe earlier if I’m lucky enough to nab an ARC. This series is a gem and it’s quickly become a favorite of mine. I read this in a day and I implement a 5-star policy for any full-length novel that can keep me engaged enough to read it that quickly. I suspect when the third and final book is released, it will be the same. 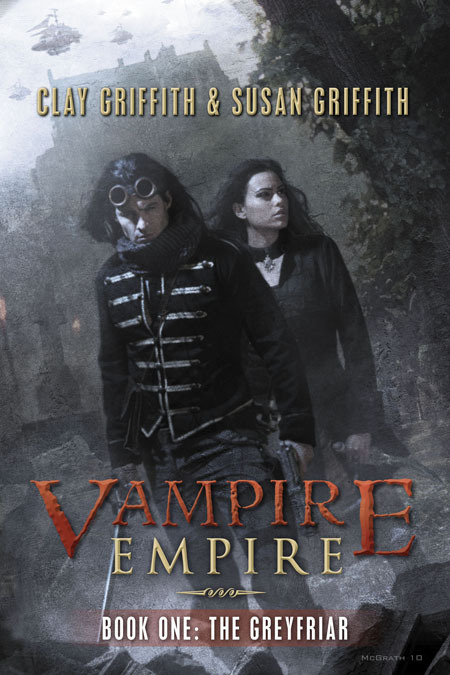 The Greyfriar (Book 1 in the Vampire Empire Trilogy) was my first proper introduction to the steampunk genre. 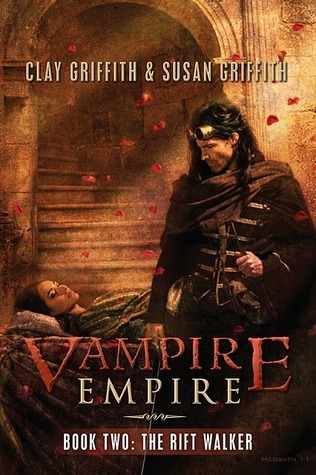 In this bold alternate universe authored by husband and wife team Susan and Clay Griffith, vampires are vicious, powerful, and wisely feared by the human population. 150 years ago, vampires and altered the course of history as they emerged and destroyed much of human civilization toward northern territories, forcing survivors to move south. But humans are resilient beings and with time they become determined to fight back and restore their glory. Part of that fight includes Princess Adele of Alexandria, a young lady poised to marry American Senator Clark in a political move that will unite their people and allow a full scale war against their fanged enemies. All goes according to plan until Adele is captured by the enemy and held prisoner in the northern lands. All hope seems lost, but there is The Greyfriar, a mysterious and legendary masked warrior that’s able to take on the vampires and win. He aides Adele, helping to keep her alive in this hostile territory. I was pleasantly surprised with this book. I will say that the beginning started out really great and action-packed, but then it hits a bit of a slump for me becoming riddled with politics and side characters that I know are important, but I found myself not caring about it very much. In short, I was bored for a good deal of time. I liked Adele and Greyfriar’s point of view and wanted more of that, so I was considering giving up on the book until it hit the 50% mark. 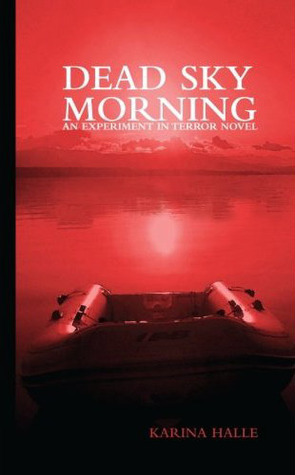 After that I was really hooked and finished the book being really happy that the second book was available. There is a lot of world building, but it’s really pretty fascinating as it incorporates airships, special weapons, and even a unique sense of wardrobe which really drives home that steampunk feel. Adele makes mistakes, but overall for me she was a likable heroine. She is not the same person by the end of this book as she was in the beginning, so it was a satisfying evolution that promises even more as this trilogy unfolds. I want to say a lot about the Greyfriar, but I found a pleasant surprise as I read the book, though I will not spoil it in this review. All I will say is that his character also experiences significant evolution. He was probably my favorite character. It’s nice when the title character can accomplish that, especially for me because I’m usually the type of reader who often follows a series for the sake of the side characters. There’s a lot of action, a real sense of adventure, and a building romance that really make this book a success. I wasn’t expecting to become attached to these characters, but by the end I found myself completely invested in what would happen next. The book isn’t perfect, but I finished reading it being really glad that I invested in it.